For the past two seasons I’ve had a wreath on my front door, because I like the little handmade reminder of nature as I cross the threshold to home. 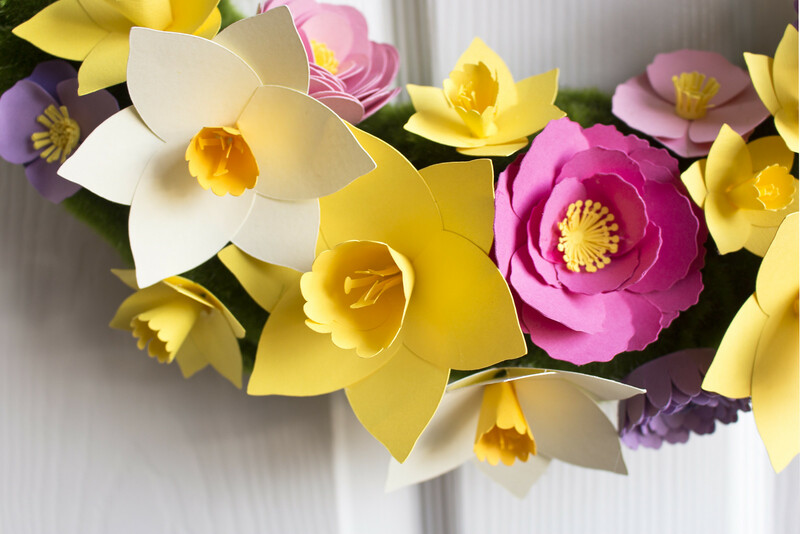 So, after the wreaths of paper leaves for autumn, and paper snowflakes for winter, I decided upon some paper flowers for spring. 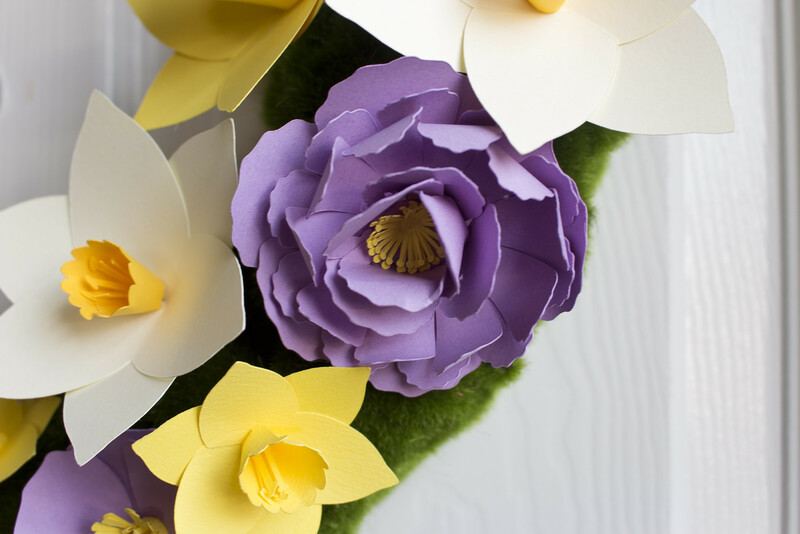 The majority of the flowers are daffodils, which perhaps symbolise early to mid-spring more than any other flower in the UK, with their bright yellow trumpets calling the announcement that spring is finally here. All of the earlier papercraft projects that I have made with the Cricut have been from templates of my own design, but I decided to have a look in the Cricut store of pre-prepared shape and designs before starting this project, and there happened to be a free month of Cricut Access (which gives you unlimited access to a large number of project cuts) on a free trial offer, and I found most of these flowers on there, ready to cut. I cut the flowers as they were, resizing a few. The only ones I altered in any way were the pale narcissi with the small yellow trumpets. I resized those to give a larger size difference between the yellow corona and the pale petals, as these are some of the daffodils (along with the large and smaller bright yellow blooms) most familiar to me. 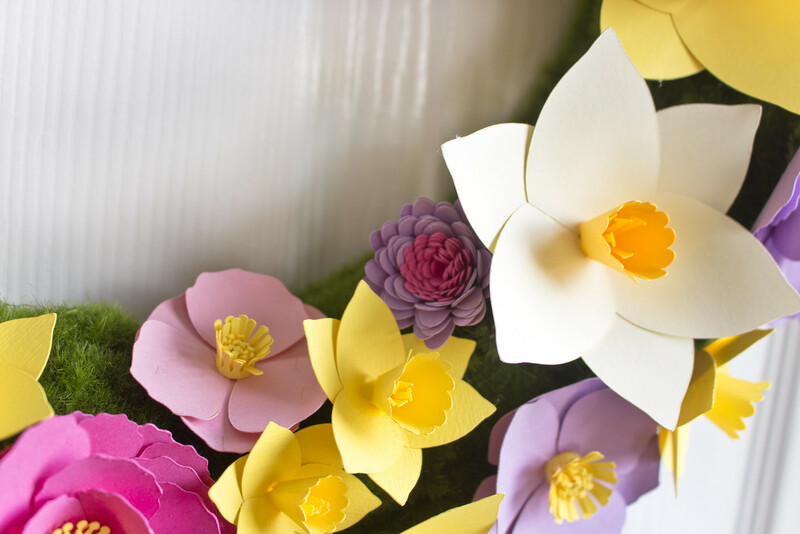 The flowers were all pretty simple to assemble, if a little fiddly at time, trying to get the glue to set. I used UHU glue as it was what I happened to have on hand, pressing the joins together and letting them come apart again, to make the areas tacky, then holding them together for ten seconds until they were bonded. I hadn’t bought a wreath form when I made the flowers, so I made them without any foresight as to how I might arrange them. 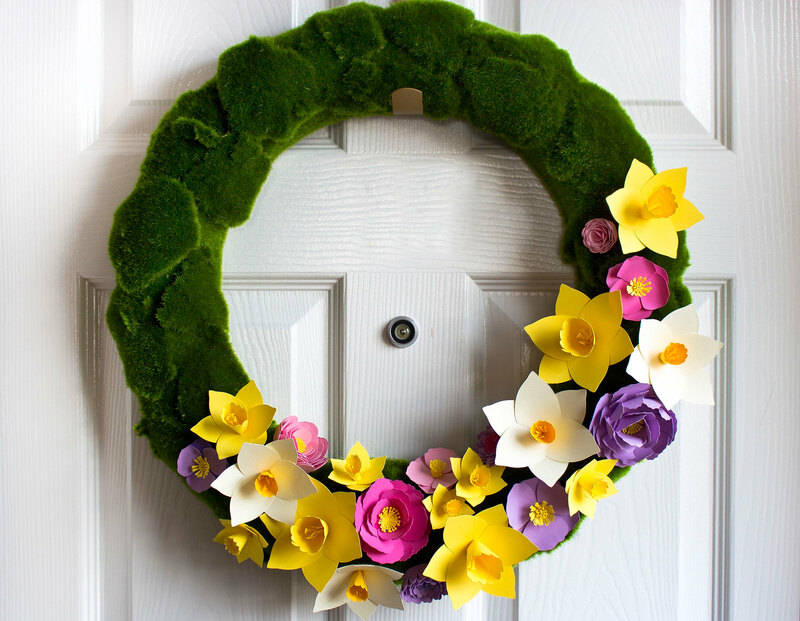 When I went to the craft store in search of a form for the wreath I saw this rather large moss-effect wreath for only £5, and as it was completely different in style to the ones I’d used for my previous wreaths, and was already green and spring-like, I decided that it would work nicely. 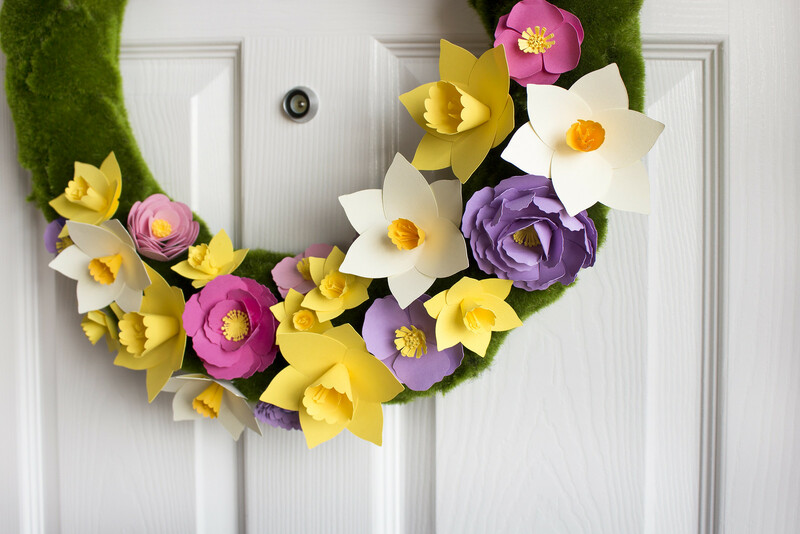 I arranged the flowers along the wreath until I ran out of prepared blooms, spacing the pink and purple blooms among the yellows of the daffodils without too much planning. I glued the blooms in place with UHU glue (a hot glue gun would likely have been easier, but it was in the cupboard and I was being lazy) and hung it up with my trusty wreath holder, which probably does more work than it’s £1 price tag could have expected. Welcome, spring!